Kim Jong-Un is coming of age. What’s next? (Leonid Petrov, The University of Sydney) The power succession in North Korea has reached its culminating point. Kim Jong-Il, who died seven months ago, left his youngest son, Kim Jong-Un, as the successor but appointed a number of high-ranking officials to mentor him and help ensure a smooth transition. Now the training wheels are being removed and the young Kim is about to show the world who he really is and what he is capable of. After six months of training in the driver’s seat, Kim Jong-Un has decided that he is mature enough to rule the country single-handedly. The sudden ousting of his military mentor, Vice Marshall Ri Yong-Ho, is puzzling and can only be explained by a serious conflict which happened between the regal student and the soldierly supervisor. The hastiness with which the 69-year-old veteran was relieved of his duties in the Army and deposed from the Party was comparable only to the grand purges of the 1960s conducted by Kim’s grandfather, the DPRK’s founder and Eternal President Kim Il-Sung. There are rumours that Ri Yong-Ho defied the dismissal and ordered his men to open fire, leaving some 20 or 30 people dead. As for the reason why the young dictator would sack his mentor in such a dishonourable way, one may only guess and assume that Kim Jong-Un simply decided to get rid of the last element of guardianship imposed by his late father. In addition to Kim’s numerous positions within the party and military: the First Secretary of the Korean Worker’s Party (조선로동당1비서), the Chairman of the Central Military Commission of the KWP (조선로동당 중앙군사위원회 부위원장), the 1-st Chairman of the National Defence Commission (국방위원회 1위원장), and the Supreme Commander of Korean People’s Army (조선인민군 최고사령관); Kim Jong-Un has recently been coronated with the highest military rank of Marshal (공화국 원수). Prior to Kim Jong-Un this rank in North Korea was held by his father and grandfather and, therefore, is an indication of the peerless status associated with the position. Another dimension of the power succession process can be traced to the cultural performance, which Kim Jong-Un attended a week prior to Ri Yong-Ho’s fall from grace. The newly established light music band “Moranbong” gave its first concert which was broadcasted nationwide. Rumour has it that Kim Jong-Un personally came up with the idea for the concert and selected its performing members. The unusual nature of the show raised the eyebrows of everyone who saw it. Short skirts, revealing tops, and the trendy haircuts of the all-female music band were just the beginning. Walt Disney characters Mickey and Minnie Mouse, Winnie the Pooh, Tiggrer and other symbols of Western animation culture were warmly welcomed by the Mao-suited dictator and his uniform-clad military milieu. 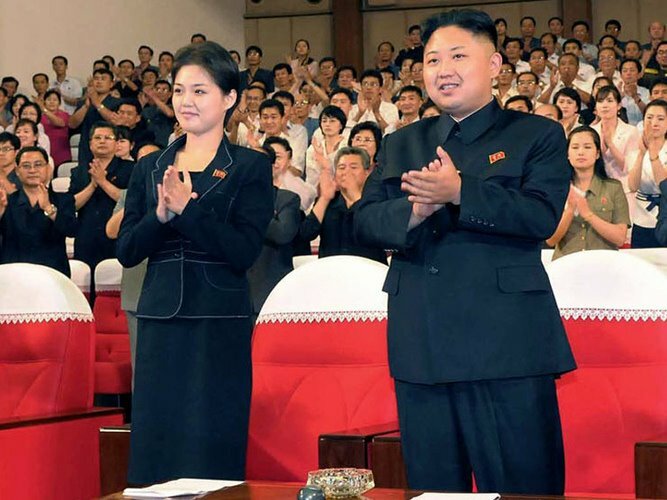 The mysterious lady, who has recently accompanied Kim Jong-Un on most cultural functions, including visits to the elite kindergarten and “Moranbong” concert, turned out to be his wife, Ri Sol-Ju (also known under the name Hyon Song-Wol, a former singer from the Pocheonbo Electronic Music Ensemble보천보전자악단). Conspicuous by her gymnastic posture, short hairdo and trendy western clothes, she looks more sophisticated than her rotund apparatchik-like husband. Nevertheless, it is a new step in promoting Kim Jong-Un’s public image. He is now being seen by North Koreans as a mature man and head of the family, rather than the youngest child of Kim Jong-Il. As a person who has achieved prominent social and political status he now also enjoys the top spot in the military. These are coded signals designed to reassure the North Korean population that they are being ruled by a powerful, shrewd and caring leader. Kim Jong-Un looks young but prominent; he is conservative in style but modern in heart; he might be ruthless to subordinates but is always benevolent to the common people. The purpose of the recent cosmetic changes and scandalous reshuffles is to diffuse the issue of legitimacy, which Kim dynasty inherently faces with each succession. Many important questions (such as: Who is this clumsy young man parading in his granddad’s costume? Can he feed the nation of 23 million people? Will he bring about peace or war?) are superseded by the bizarre mix of pseudo K-Pop shows, fake Disney parades, and the bloody shoot-outs between vice-Marshals. Can Kim Jong-Un deliver the many promises which his father and grandfather bequeathed to the population of the Democratic People’s Republic? Relations with South Korea will stay strained until the conservative government in South Korea is replaced by the moderates, who may opt to once again take up the imperfect “Sunshine policy”. Pyongyang’s dialogue with Washington D.C. will remain indefinitely mute or at least until Kim Jong-Un gives up the nuclear program of which he is so proud. Russia is too pragmatic to lend more money to the bankrupt regime. China expects the young leader to embrace economic reform, something that Kim cannot permit due to potentially catastrophic consequences for the DPRK’s political system. In other words, Kim Jong-Un is left with few choices, none of which seems suitable. Any attempt to liberalise economic life in North Korea would leave Kim’s clan vulnerable to the turmoil of a legitimacy crisis. Moreover, in the process of market-oriented reform, some of the elite groups which are associated with non-productive sector of the economy (the party, the army and state security) will find their role obsolete and their socio-economic status will be predictably worse. Disillusioned masses and angry elites are the best recipe for popular uprising and a collapse of the Kim dynasty. This scenario is the worst nightmare for Kim Jong-Un and his close circle of trusted advisors. Despite some temporary disagreements and purges, the North Korean leadership will continue supporting superficial change but will resist any attempts at a full-fledged reform. Mickey and Minnie Mouse will continue dancing on Korean Central TV (조선중앙텔레비죤), but the Military-First Politics will remain the cornerstone of domestic politics and the main impediment for economic and political liberalisation. The dynastic system, however outmoded and ineffective, permits the young Marshal to keep his subjects loyal and competing for favours. North Korea as we know it cannot be reformed. The problem is that the state is a hostage of its own history. So many lies and horrible crimes have been perpetrated during the 65 years of tyranny that the youngest of the Kims cannot open up the country without betraying his predecessors or jeopardising the foundations of his own rule. Any attempt to reform the system will lead to a legitimacy crisis, public unrest, the fall of the dynasty, and uncontrolled unification. Attempts to avoid this scenario will only protract the agony, permitting North Korea to slowly change in form but not in content. Read this article in Korean here… 김정은 시대가 열리고 있다… 다음은? (SBS TV World News Australia, 2012.07.18) SBS Presenter/Reporter Kathy Novak talked to Dr Leonid Petrov from the Department of Korean Studies at the University of Sydney about the appointment of North Korea leader Kim Jong-Un as Marshall and the top-level changes he has made. Here is a transcript of the interview. Kathy Novak: Dr Petrov, what does this appointment of Kim Jong-Un as Marshall mean? Dr Leonid Petrov: I think it is the culminating point of the transition – the power transition in North Korea. Kim Jong-Un’s father died seven months ago and he bequeathed a number of people who supervised Kim Jong-Un’s smooth transition into the top driving seat in the country. This week we just saw the ousting of the former supervisor of Kim Jong-Un, Vice Marshall Ri Yong-Ho, the one who was appointed by Kim Jong-Un as the supervisor for Kim Jong Un. It looks like the family decided that Kim Jong-Un is mature enough to rule the country single-handedly. He is now the supreme commander, the Marshall of the Korean People’s Army and the first secretary of the central committee of the Korean Worker’s Party and the legitimate heir for the Kim’s dynasty to rule the country. Kathy Novak: We’ve seen other signs of change this week including the televised concert with Disney characters featured. What do you make of all of that? Dr Leonid Petrov: I think that was another dimension of this transition process because along with Kim Jong-Un in the concert which happened just days before these major events in politics were unfolding, we saw a mysterious lady accompanying Kim Jong-Un, it’s his partner Hyon Song Wol, a former dancer from Pocheonbo Electronic Music Band. Obviously, it’s a new step in Kim Jong-Un’s image. He is now being seen by North Koreans as a mature man, head of the family, not just the youngest son of Kim Jong-Il but as the person who is mature both family wise and politically wise. Now in terms of military power, he is the supreme person in North Korea too. Kathy Novak: So do you think all of these signals and upcoming change in foreign policy when it comes to relations with South Korea and also the West? Dr Leonid Petrov: With South Korea, relations can continue to be at its lowest point as it is now but it’s not just Kim Jong-Un’s fault. Now that the conservative government in South Korea came into power 5 years ago with promise to be pragmatic towards North Korea, but rather they were ideological and inter-Korean relations collapsed completely. A couple of years ago we saw they were nearly very close to the point of war. This year December, South Korea is going to have the national elections and we will see the change of government. We don’t know whether it will continue to be conservative, liberal or progressive government as much will depend on what happens in Seoul. Not just Seoul but also Washington DC is playing an important role. This year’s election in the United States and if the Obama administration continues to stay in power and the second Obama administration may be willing to see both Korean states reconciling, we might witness much more dynamic interaction between North and South, dialogue cooperation and possibly reconciliation – something that we saw during this ten year of Sunshine Policy between 1998 and 2008. Kathy Novak: Have there been much reaction so far to these changes from the United States? Dr Leonid Petrov: The Unites States in the last four years of the Obama administration was pursuing a kind of hands-off policy towards North Korea. Periodically, Obama was offering the olive branch to Pyongyang but the signals coming from North Korea were very mixed. Remember that the “Leap Day” agreement of 29th February which actually gave a lot of expectation and optimism to Pyongyang-watchers that United States might improve their bi-lateral relations. But just ten days later North Korea announced the launch of the rocket which derailed completely this progress. So there were on and off attempts to improve relations but it didn’t eventualise and simply we can’t see any fruit so we will have to wait until the end of this year. Kathy Novak: Now we’re trying to read these small signs of change of North Korea but of course it’s such a closed state. How hard is it to predict what will happen? 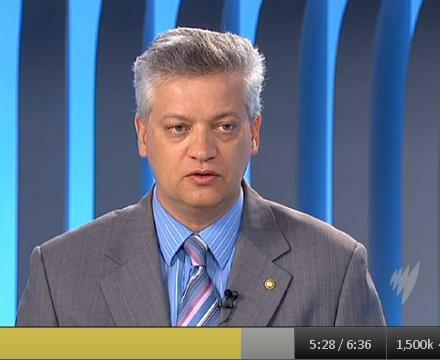 Dr Petrov: It’s impossible to predict what will happen simply because there are too many factors. It’s not just Pyongyang. It’s also Seoul factor and Washington factor so we will have to wait untill the end of this year. But what we can say for sure is that Kim Jong-Un has a very difficult task to perform. He is expected to bring North Korea to a state of prosperity, security and economic development – something what his father promised. The year 2012 was the centennial anniversary of Kim Jong-Un’s grandfather. So far, North Korea demonstrates some superficial signs of prosperity, including the new types of concerts – Minnie and Mickey Mouse dancing on national TV and Kim Jong-Un is in the limelight with the first lady. Old vice Marshalls being demoted and new figures being promoted – younger generation is stepping forward. But there’s not any sign or any hint at the change of the direction. Simply North Korea can’t reform itself. The problem is that the state is a hostage of its own history. So many lies, so many horrible things were perpetrated during the 65 years of Kim’s dynasty rule in North Korea that Kim Jong-Un cannot reform the country, cannot open it up, cannot democratise it. Otherwise it won’t be North Korea. There will be an uncontrolled unification and there could be a mass riot. I’m rather pessimistic about the developments in North Korea. It looks like it will continue to change in form but not in content. Kathy Novak: Dr Petrov, thanks very much.